Written by spectroscopists for spectroscopists, here is a book which is not only a valuable handbook and reference work, but also an ideal teaching text for Fourier transform methods as they are applied in spectroscopy. It offers the first unified treatment of the three most popular types of FT/spectroscopy, with uniform notation and complete indexing of specialized terms. All mathematics is self-contained, and requires only a knowledge of simple calculus. The main emphasis is on pictures and physical analogs rather than detailed algebra. Instructive problems, presented at the end of each chapter, offer extensions of the basic treatment. Solutions are given or outlined for all problems. The book offers a wealth of practical information to spectroscopists. Non-ideal effects are treated in detail: noise (source- and detector-limited); non-linear response; limits to spectrometer performance based on finite detection period, finite data size, mis-phasing, etc. Common puzzles and paradoxes are explained: e.g. use of mathematically complex variables to represent physically real quantities; interpretation of negative frequency signals; on-resonance vs. off-resonance response; interpolation (when it helps and when it doesn't); ultimate accuracy of the data; differences between linearly- and circularly-polarized radiation; multiplex advantage or disadvantage, etc. Chapter 1 introduces the fundamental line shapes encountered in spectroscopy, from a simple classical mass-on-a-spring model. The Fourier transform relationship between the time-domain response to a sudden impulse and the steady-state frequency-domain response (absorption and dispersion spectra) to a continuous oscillation is established and illustrated. Chapters 2 and 3 summarize the basic mathematics (definitions, formulas, theorems, and examples) for continuous (analog) and discrete (digital) Fourier transforms, and their practical implications. 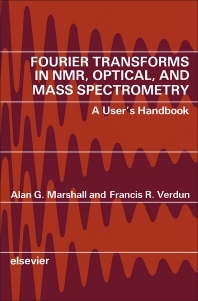 Experimental aspects which are common to the signal (Chapter 4) and noise (Chapter 5) in all forms of Fourier transform spectrometry are followed by separate chapters for treatment of those features which are unique to FT/MS, FT/optical, FT/NMR, and other types of FT/spectroscopy. The list of references includes both historical and comprehensive reviews and monographs, along with articles describing several key developments. The appendices provide instant access to FT integrals and fast algorithms as well as a pictorial library of common Fourier transform function pairs. The comprehensive index is designed to enable the reader to locate particular key words, including those with more than one name. Spectral Line Shape Derived from the Motion of a Damped Mass on a Spring. 2. Fourier Transforms for Analog (Continuous) Waveforms. 3. Fourier Transforms of Digital (Discrete) Waveforms. 4. Fourier Transform Spectrometry: Common Features. 5. Noise. 6. Non-FT Methods for Proceeding from Time- to Frequency-Domain. 7. Fourier Transform Ion Cyclotron Resonance Mass Spectrometry. 8. FT/NMR. 9. FT/Interferometry. 10. Epilog: Fourier Transforms in Other Types of Spectroscopy. References. Problems (at the end of each chapter). Solutions to problems. Appendices. Index.